Working with animals was always part of Clare’s plan. Originally from Canada, she graduated from UBC in 2007 with a Bachelor of Science in Animal Biology and started work with The Vancouver Aquarium and their Marine Mammal Rescue Centre. Seeing the work of their Vets and Vet technicians ignited her passion for Veterinary Science. She came to Australia in 2009 and started her first year at The University of Queensland School of Veterinary Science. During her studies, Clare came to work with The Animal Emergency Service as a receptionist in 2012 and found her love for Emergency Medicine. Needless to say, when an opportunity to undertake an internship with AES presented itself after graduation, she jumped at the chance. The standard of care practiced and the unwavering support of the staff is unmatched. At AES they are always striving to improve their knowledge and skills in Emergency Medicine. 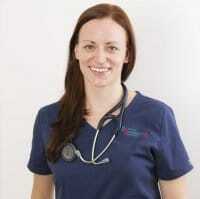 In following with this aim she undertook and was awarded her Membership in Emergency and Critical Care Medicine in 2017 and became one of the AES’s Senior Vets. Clare loves the fast pace of Emergency Medicine and knowing that every shift they get to help families in their time of need. She’s proud to call herself a member of this amazing team.